We can provide Portable Gas Analyzers for Oxygen, Carbon Di-oxide, SO2, NO, CO, CO2, CH4, H2, CnHm, BTU, H2S etc. Our analyzers are based on Electrochemical, Paramagnetic and IR principle. The measurement can be PPM / Percentage. These analyzers can be supplied with portable sampling handling system as well. - This unique analyser is certified to zone 0 without the need for purge. - Suitable for measuring % levels of Oxygen, Carbon Dioxide and Carbon Monoxide. 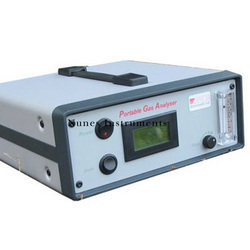 Fuel gas analyzers for O2, CO, CO2, NOX gases for pollution check & efficiency of boilers. Economical and sturdy dissolved gas analyzers with 2/3/4 injection ports as per IS and CORE Standards.